Home › Latest News › Let's Get Ready To Ride! The riding season is back! 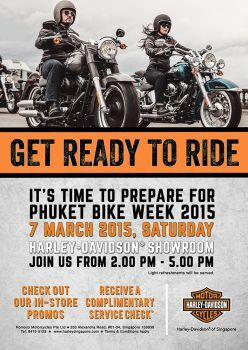 With April only about a month away from now, it's time to gear yourselves up for Phuket Bike Week! Join us this Saturday, 7 March, in our showroom to check out our in-store promos. All bikers and non-bikers are welcomed! Terms and conditions apply. Venue: Harley-Davidson Dealership, 253 Alexandra Road #01-04 Singapore 159936.